Lots & Lots Of Food Report WITH Pictures First Ever??? Just seen this food report, usually don't go into the dining section ( don't know why I LOVE TO EAT!) First thing I was thinking, OM Goodness you must be rolling out and need a wheel barrel to get around!! haha, Lots of great info.... most top notch rest. my husband and I have eaten is Le Cellier, looking forward to the others as Rebekah (4) gets older, right now character meals are important ( I'm not complaining, good excuse for me to see them). Have you eaten at Artist Point, interested in that review? Can I ask you overall, not just this past trip report, what your fav. counter, table, and sig. dining spots are? I had to laugh at this post! Awesome photos!!! 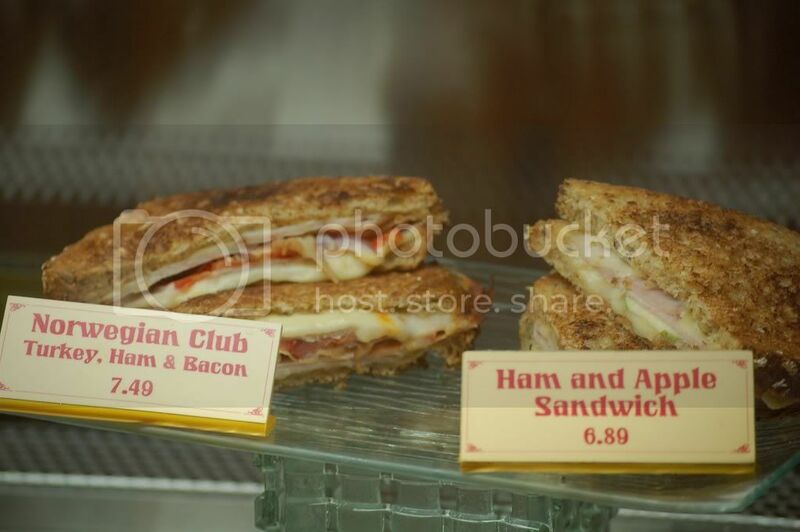 Seriously, though...the ham/cheese/apple sandwich is one of my favorites! Kringla Bakery is one of our favorite stops for a "counter service" credit, if we're on the Dining Plan. GREAT value...a sandwich, salad/fruitcup, dessert & drink for a counter service credit! Thanks for all of your great pics!!! I read both your reports. the trip report is really good, but the food report... AWESOME! I'm planning on visiting WDW this year after 14 years of not going and your report has been really useful. Now I kinda know where I want to eat. The weight gaining will be a big issue for me though, cause I want everything in it and I'm only going for 5 days... so imagine.. looks like there will be no time for rides cause there's so mouch I gotta eat! :brick: plus maybe a couple mickey ice cream bars a day... Ok, now I'm holding you responsible for me turning into a pig! No, I'm just kidding, I know I'll try some of it (including the strawberry shortcake) and hey! I'll have a reason to go back soon and try some more! 14 years!!! What the heck have you been waiting for?? I got some PM's about restaurants so I wanted to bump this up...Even though I will be making a new one very shortly! I have been drooling over your food pics the last several weeks trying to find entrees my hubby's limited palette will approve of... well, ones that I would be able to get ADRs for in a month so several cancel themselves out anyway :brick:. Great pics! Very informative and helpful!! Can't wait for the next Food Report!! You got like 14 different costumes and outfits to wear around WS so you can follow us around and blend in without being seen. Haha thanks! The same blood, sweat and tears will be put into the next one in a few shorts days! Be ready!!!! Bring on the food ****!!! :slurp: I for one CANNOT WAIT to read your trip report and see all the food pics!! I looked at all your pictures from this trip report and my family and I made many of our menu picks based upon photos and your descriptions. I think it is extremely helpful to actually see the entree as often the menu descriptions are confusing or hard to visualize. I think you have the perfect attitude about food at WDW...it's theme park food and of course it is overpriced but oftentimes it is very good as long as you know where to eat and what to order. I agree that one cannot (or should not) compare the food at WDW with a gourmet restaurant halfway around the globe. Anyway, I will rant on forever if allowed....soooo let me just say that I appreciate the time and effort you put into your trip reports. Looking forward to seeing some yummy food photos, reading your always humorous and irreverent take on the WDW tourists and seeing some gnarly photos of the strange species of people that frequently inhabit WDW...the Disneous touristous. The most unusual of that species often a subset of the species labeled Disneous touristous internationales Make sure to take lots of photos if you spot the illusive creatures....but watch out for their wicked toe spears! I have a similar obsession with strawberries...I can't believe how many starwberry selections I have missed! Looks like I have my work cut out for me in a couple of weeks. :slurp: I can't wait for your new report! I thought that drooling while looking at delicious food only happened in cartoons.. you learn something new every day. Mmmmmmm! We'll be at WDW in two weeks, and this thread has inspired me to take food pictures for myself, to share them here. I very much enjoyed reading your trip report, despite it making me burn with **** for WDW food. Haha cool stuff. Can't WAIT to see your pictures that you come back with!! !